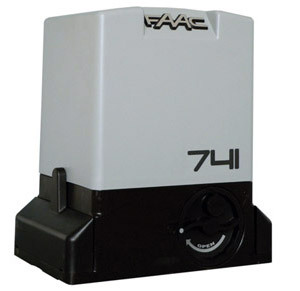 Operator for sliding gates FAAC 741 The 740-741 automated system is ideal for controlling vehicle access areas of medium transit frequency. The 740-741 automated system for sliding gates is an electro-mechanical operator transmitting motion to the sliding gate via a rack pinion or chain appropriately coupled to the gate. Operation of the sliding gate is controlled by an electronic control unit housed inside the operator or in a hermetically sealed outdoor enclosure. 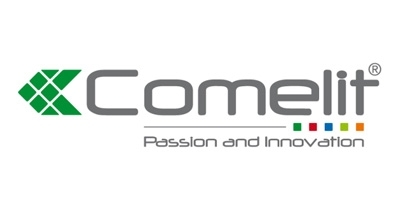 A new generation of transmitters with a unique and distinctive design. Two technologies: SLH: Self Learning Hopping code with transmitter-to-transmitter programming functionalities (FAAC patented) RC: Rolling Code. Selection guide: If you are extending existing systems or adding new users to existing systems, we advise you to use transmitters with the same decoding of those currently in use. New systems: Establish use frequency - 433 MHz or 868 MHz If performance is unsatisfactory due to disturbances generated by electrical devices, voltage power lines, or powerful radio transmissions in the zone, change over to the other European frequency. Select the type of decoding you require: RC = ROLLING code: the code varies whenever the transmitter is used. An algorithm recognises and confi rms the signal, but only that of the transmitters coded by the receiver. Advantages: cloning virtually impossible. 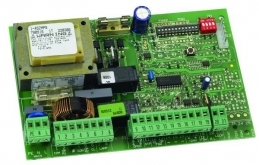 the coded transmitters can be replicated without directly operating on the control board. SLH = SELF LEARNING HOPPING code: the code varies whenever the transmitter is used. An algorithm recognises and confi rms the signal, but only that of the transmitters coded by the receiver. Advantages: cloning virtually impossible. 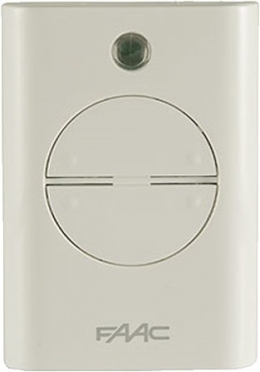 the coded transmitters can be replicated, also in remote mode from the receiver, with the patented SELF LEARNING system (from transmitter to transmitter), by simply pressing the keys according to a specifi c sequence. NOTE: fully compatible with the old generation SLH transmitters.